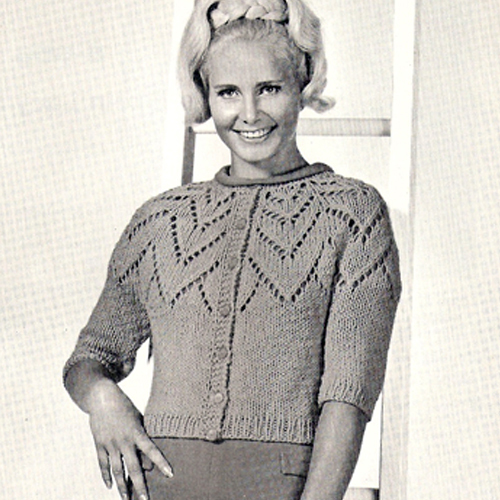 Back in the late 1960s, Coats and Clark put out patterns for Petal Knit Cardigan Sweaters. 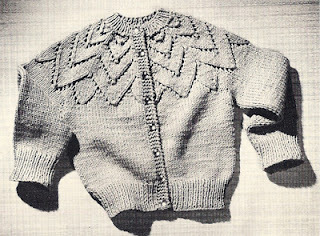 First, there was the Childs Petal Cardigan, put out in Book 158 (Jiffy Knit Patterns). It's a delightful little pattern with the petal design across the yoke, elbow length sleeves and just the right amount of ribbing. I'm sure it was knit by many a mother. The popularity was well noted in that Coats and Clarks duplicated the pattern to a misses size and issued it in 1968 in their Book 185, Quick Fashions. 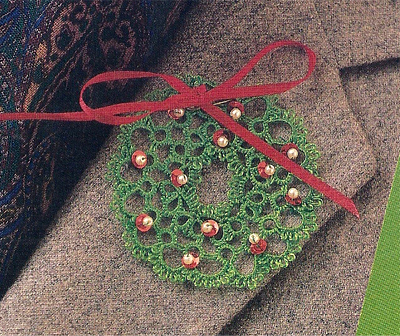 The misses cardigan was also issued as a "Timesaver Design leaflet. I've seen some reference that these patterns may actually go back to 1952, however, I've not seen an actual picture that quite matches up. If you happen to know anything more, I'd really appreciate learning more about the design. I was standing in Kohl's looking at purses about a week before Halloween and realized they were playing the old White Christmas Classic from Bing Crosby over the sound system. I, literally called out - "You've got to be kidding; it's still October". Two ladies near me exchanged looks, but Beau got the point and we left very quickly. But, it's now November and Thanksgiving is approaching. There are Christmas commercials on TV and our subdivision is issuing the holiday decorating dictates. Guess I'll just face the facts and get in the mood. How about we start here with an ornament? Here's a pretty little tatted ornament. After tatting, it is further enhanced with little pearl beads nestled on a sequin and finished with a bow at the top. You can wear it as a pin, or use another ribbon to string it and put it right on your Christmas Tree, hang around your review mirror, or .... whatever you might like. I've listed this free Tatting Pattern in the shop should you want to give it a try.